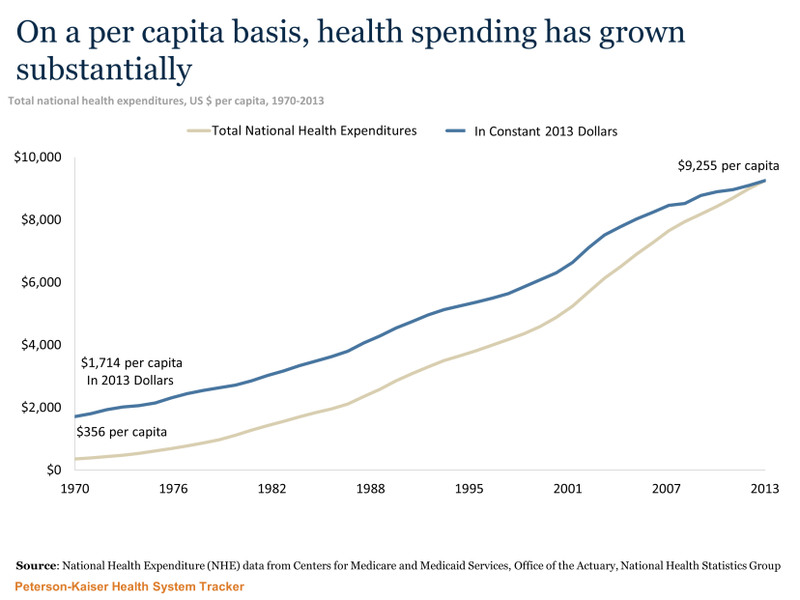 While health spending growth has slowed in recent years, over the long-term healthcare costs have grown significantly, with per capita spending increasing about tenfold since the early 1980s. Health spending growth has consistently outpaced U.S. economic growth and is higher than health spending in other wealthy countries. Despite spending more, the U.S. does not have better outcomes in terms of better health or longer life. Considerable attention has been given to the high level of medical spending in the U.S. and the challenges it poses to public and private budgets. Less understood are the different components of cost growth (e.g., price vs. utilization), how the components differ across sectors and funding sources, and how the various drivers of health spending have changed over time. Disaggregating health spending and its growth provides information health industry leaders, policymakers, and the media can use to better understand financial challenges, target policy initiatives, and assess the implications of potential system changes for patients, providers, and payers. Health outcomes, or what we are getting in exchange for this spending, are even less well understood and are extremely difficult to measure. For other sectors of the economy, measurement of output is often a relatively simple matter of tabulating goods sold or productivity: one can count how many TVs or cars are produced and the resources that went into producing them. Healthcare output can also be measured in terms of the goods and services patients receive – the numbers of physician visits, hospital admissions, and prescriptions are examples – but output alone is an unsatisfying measure of what we hope to receive in return for health spending. What we want are better health outcomes: to get healthy when we become sick or injured and, even better, to avoid getting sick in the first place. It is hard to quantify these outcomes and even harder to put a price on any amount of improvement. Complicating any assessment of health system performance is the problem of distinguishing health system impacts from those that stem from other societal drivers. Many factors outside of the health system – such as poverty, diet, exercise, substance use, environmental factors, and social policies – not only contribute directly to health status, but also affect access to medical care. Even when potentially informative measures can be identified, consistent trend data may not always be available at the health system level for the U.S. and other countries. Historically, more emphasis has been placed on cost than on health system outcomes. However industry leaders and policymakers cannot make good judgments about spending without understanding how well the system is working for patients. To put it simply, we need to better understand how much we are spending, what is driving growth, and what we are getting for what we spend. This means tracking how well the health system is performing at keeping people healthy and treating them when they get sick. Are we getting better health outcomes for our increased spending? If we are successful at reducing growth in spending, is there a sacrifice in terms of health? At the broadest level, we can think of a dual focus on health system spending and outcomes as assessing the efficiency of the health system. The Peterson Center on Healthcare and the Kaiser Family Foundation are partnering to create the Peterson-Kaiser Health System Tracker. The aim is to provide an objective resource to help policymakers, journalists, industry professionals, and other stakeholders understand trends in U.S. health spending, how well the system as a whole is performing to improve health outcomes, and how efficiently it is doing so. In all of our analyses, we are taking a macro view in assessing the performance of the U.S. health system. As such, the Tracker does not endeavor to compare individual hospitals or insurers, rank states, nor assess particular medical interventions. There will be a heavy emphasis on data and evidence, addressing key questions through collections of charts, as well as a blog to provide context and synthesize the latest research and developments. We will also provide regular insight briefs that focus in greater depth on topical questions. One aspect of our analysis will be a comparison of U.S. health system performance measures to those of other countries. In doing so, we identified a group of countries that are economically similar so that we can look at differences across countries with reasonably comparable opportunities and resources to devote to health care. We selected member countries from the Organisation for Economic Co-operation and Development (OECD) based on the size of their economy (having a total GDP above the median for OECD countries) and their level of income (with per capita GDP greater than the OECD median) in at least one of the past 10 years. As national health spending correlates strongly with GDP, lower income countries are not generally comparable to the U.S., and smaller countries face different challenges in structuring their delivery systems. Taking a cross-national approach has the advantage of seeing how health systems organized differently from ours produce different outcomes and utilize resources differently. At the same time, cross national differences in spending and outcomes may reflect differences in factors outside of the health system, such as inequality, lifestyle, politics, and culture. Another approach we will use is to look at trends in the performance of the U.S. health system over time. This avoids the substantial cultural and behavioral differences that exist across countries. However, trends move very slowly – particularly in the case of health outcomes – so changes become apparent only through observation over long periods of time. This slow pace also poses challenges in attributing changing outcomes to particular innovations or interventions in policy, medical science, or the delivery system. Nonetheless, the examination of trends over time can reveal where the health system has made progress and where gaps still exist. One can also learn a great deal about what is driving changes in spending or outcomes by looking at different payers and market segments (e.g., Medicare, Medicaid, and private insurance). Breaking down trends and cross-national comparisons by different sub-groups (e.g., by income, insurance status, disease, race, gender, and ethnicity) can also reveal how equitable the health system is – an important element of health system performance evaluation that may reveal the greatest opportunities for improving outcomes. Some examination of regional variation in spending and outcome measures can also shed light on underlying drivers of healthcare spending or successful strategies to improve outcomes. We are initially launching with a set of foundational resources, described below, upon which we will expand over time to explore the historical and current drivers behind health spending trends and the latest research on ways to reduce costs and improve outcomes. The cost of healthcare in the U.S. The U.S. spent almost $2.9 trillion dollars on health care in 2013 (the most recent year with comprehensive data available), or about $9,255 per person (up from $1,714 in inflation-adjusted terms since 1970). Total health spending – which includes spending by both public and private payers on healthcare, administrative expenses, public health, and health research – has grown substantially over time. In nominal dollars, national health spending has increased over 3,600 percent since 1970 (from $74 billion in 1970, to $1.4 trillion in 2000, up to $2.9 trillion in 2012). While other countries have also seen rapid growth in health spending, the U.S. spends far more on health per capita and as a share of the economy. Per capita health spending in the U.S. in 2012 was 42% higher than Norway, the next highest per capita spender. We currently spend 17% of our GDP on health-related expenses (through both public and private funds), compared to an average of 11% of GDP in comparably wealthy countries. The U.S. has not always been such an outlier. During the 1980s, the gap in health spending as a share of the economy between the U.S. and other wealthy OECD countries widened considerably, with per capita health spending in the U.S. growing faster than any comparable OECD country (10.0% average annual growth compared to an average of 7.1% in comparable countries). The gap largely stabilized in the 1990s but started to grow again during the early 2000s, and once again has stabilized in recent years as health spending growth has slowed in the U.S. and in other countries. The health care marketplace in the U.S. is quite different from comparable OECD countries. In 2012, public sector health spending accounted for about 8% of U.S. GDP and private sector spending accounted for another 9%. In comparable OECD countries, public sector spending accounted for 8% of GDP on average, while private sector spending was less than 3% on average. Over time, public sector spending has grown somewhat faster than private sector spending in the U.S. Since 1970, private sector spending has increased by 5% of GDP (from 4% to 9%) while public sector spending has increased by 6% of GDP (from 2% to 8%). The growth in public sector health spending in the U.S. has been largely due to policy changes (e.g., expanded Medicaid eligibility and the creation of the Child Health Insurance Program) and demographics (e.g., increases in the number of Medicare beneficiaries due to the baby boom) and expansions in Medicaid eligibility. In fact, on a per enrollee basis, Medicare has grown slower than private insurance. As healthcare spending rises overall, individuals and families are also spending more on healthcare. Over the last ten years, the amount an average American household spent out-of-pocket on health care and insurance grew by just over 50% from $1,827 in 2002 to $2,754 in 2012. Adjusting for inflation, the change in out-of-pocket spending over the 2002 – 2012 period was from $2,257 to $2,754 in constant 2012 dollars, or an 18% increase. Health insurance premiums make up a growing share of household health expenditures, while direct expenses for health care represent a shrinking portion of overall household spending on health. Overall, health spending growth has slowed recently, both in the U.S. and in comparable OECD countries. Debate continues among experts about how much of the slowdown is tied to the continuing effects of the economic downturn and how much is due to structural changes in the health delivery system. The fact that the slowdown has occurred in other countries as well lends credence to the economic argument, though it could also be explained by fewer new medical technologies. As the economy continues to recover, there will likely be upward pressure on health spending, though growth rates may not return to historical levels if delivery system changes (spurred in part by the Affordable Care Act) continue to take hold and generate efficiencies. Medicare spending has grown particularly slowly in recent years, and there is evidence that Medicare is more immune to changes in the economy than health spending overall. Although the U.S. continues to spend more on health than any other country, it is unclear whether this higher expenditure is yielding better results. System-wide outcomes measurement is fraught with challenges, including confounding social and environmental factors, as well as inconsistent and unavailable data. Still, across a range of measures, a picture begins to develop suggesting that while health outcomes have improved in the U.S. over time, this improvement has generally been at a slower pace than in comparable OECD countries. Health outcomes can be measured in a variety of ways, including life expectancy, mortality rates (overall and for certain conditions), the overall health of the population, and the prevalence of various health conditions. One measure that is often reported is life expectancy at birth. Life expectancy in the U.S. is lower than in other comparably large and wealthy countries, though that has not always been the case. As recently as 1980, the life expectancy at birth in the U.S. was 74 years, approximately on par with comparable OECD countries. Since that time, however, other countries have seen greater gains in life expectancy. Currently, life expectancy in the U.S. is just under 79 years, compared to an average of just under 82 years in comparable countries. While a useful starting point, life expectancy is influenced by many factors inside and outside of the health care system. For example, individual behaviors, social and environmental factors, and social values all have impacts of life expectancy. An Institute of Medicine panel recently noted that high mortality from accidents and violence and lifestyle-related factors such as diet and obesity contribute to the difference in life expectancy. Consistent with our shorter life expectancy, mortality rates for most leading causes of death are higher in the U.S. than in comparable OECD countries. One notable exception to this trend is in mortality from cancer, an area of performance measurement where the U.S. has seen marked improvement. Lung cancer mortality rates, in particular, have declined rapidly in the U.S. and may be due to lower smoking rates. In measuring health system performance outcomes, some researchers have examined deaths that conceivably could have been prevented through appropriate medical interventions. In 2006, the most recent year with available data, the U.S. had the highest rate of death amenable to health care among the comparable OECD countries included in the study (though the rate has been declining over time in the U.S. and internationally). In addition to these health outcomes, which are slow to change and can be affected by many factors beyond the health system, certain intermediate yardsticks can be good indicators of how well the health system is performing. These include measures of system activities and outputs, such as hospital safety, adherence to medical guidelines, and diagnosis rates. Additionally, patient experiences can be assessed by looking at wait times, satisfaction, and surveys of patient engagement and knowledge. Measuring system activities and outputs, such as adherence to medical guidelines, can be used to highlight the impact of system changes on specific disease outcomes. While there is still much to be done to improve the mortality rate for diseases of the circulatory system, there was great improvement from 2005 (42%) to 2011 (94%) in the percentage of patients with a heart attack given an angioplasty within 90 minutes of arrival at a hospital. Heart attacks account for about half of all deaths attributed to diseases of the circulatory system, and adherence to this medical guideline has contributed to the falling mortality rate for this disease area (268 deaths per 100,000 population in 2005 to 218 in 2010). The accessibility and affordability of health services is another important measure of the system’s performance. With just 85% of the population covered by health insurance in 2012, the U.S. has a lower rate of coverage than any other OECD country. (The OECD average is 98% and comparable countries cover 100% of their populations). Health insurance shelters people from high medical costs that can result from illness and injury. For example, the Oregon Health Insurance Experiment, which randomly assigned Medicaid to low-income uninsured residents, found that having insurance coverage reduced financial hardships and decreased the probability of a medical bill being sent to collections by 25% compared to a control group of people with similarly low incomes. The Affordable Care Act’s coverage expansion provisions, which include the option for states to expand Medicaid and federal tax credits to assist people purchasing their own coverage, are projected to increase the portion of Americans with insurance over time. The extent to which this expansion of coverage translates into more affordable care and better access will be the subject of many evaluations to come. The frequency with which Americans report delaying or forgoing care due to costs is about the same in 2013 as it was in the late 1990s. However, spikes in cost-related access problems during the most recent economic downturn and in the early 2000s were particularly pronounced among adults in worse health and the uninsured. In general, these two groups report significantly more difficulty accessing needed healthcare due to cost than do adults in better health and those with insurance. Health system performance can also be assessed in part by examining the resources devoted to achieving better health in the U.S. Systems with greater capacity – more hospital beds, more physicians, more nurses – are generally better equipped to provide more services to people, all else being equal. The U.S. has similar numbers of nurses per capita as comparable OECD countries, but has fewer hospital beds and physicians. In anticipation of more people gaining coverage in the coming years as a result of the Affordable Care Act, concerns have been raised over the system’s capacity to meet increased demand for health services, with particular concern regarding a potential shortage of physicians and regional disparities. Of course, a health system that does a better job at providing services that are clinically appropriate and effective may be able to provide comparable or better outcomes with less capacity. In recent years, health spending growth in the U.S. has slowed to historically low levels, likely driven in part by the economic downturn and in part by structural changes in the health system. However, as the economy improves, it will exert upward pressure on health spending and may lead to growing calls for efforts to contain costs. While health care costs in the U.S. are substantially higher than in comparable countries, there are also signs that our system under-performs in keeping people healthy and treating them when they are sick. Our aim with the Peterson-Kaiser Health System Tracker is to provide reliable, up-to-date information on health system performance trends, and to synthesize the latest research in these areas. Initially, the Tracker is launching with a set of basic, foundational collections of data visualizations and blog posts. These include examinations of trends in U.S. health spending by sector and payer; how spending compares to other countries; the recent slowdown in health spending in the U.S. and other countries; how mortality and life expectancy in the U.S. compare to other countries; the capacity of the health system; the health of the population and the accessibility and affordability of health care. Over time, we will regularly add new data to site, digging deeper into the key drivers of health system performance, such as: how health spending varies by disease, insurance status, age, gender, and race; the concentration of health spending among a small group of patients; how the cost of specific procedures has changed over time; the effects of price vs. utilization in driving spending growth; the role of new drug development and patent expirations; changes in the prevalence of diseases and conditions over time; trends in the quality and safety of the health system; and changes in the efficiency of care delivery. Ideally, efforts to reduce the growth in health spending will improve the health system’s effectiveness as well. The best available evidence should be used to guide those efforts and assess their success.